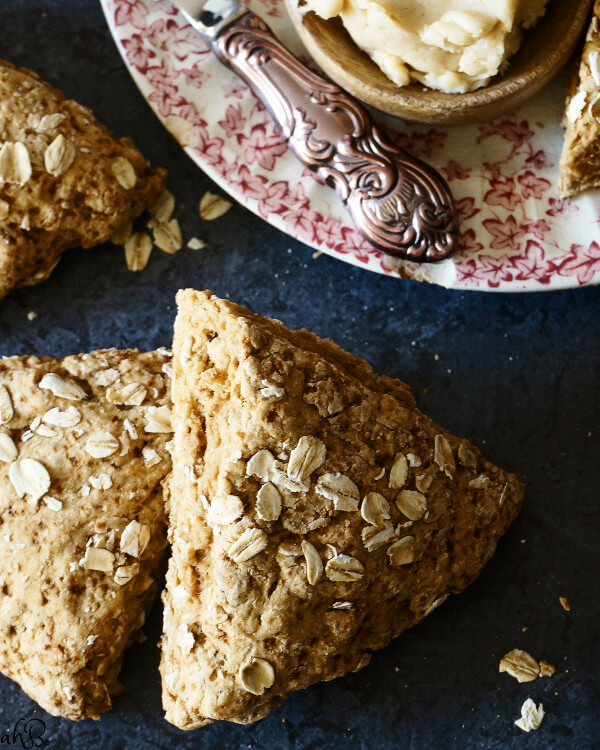 Only 20 minutes to these tender and moist whole grain scones with creamy sweet maple butter. 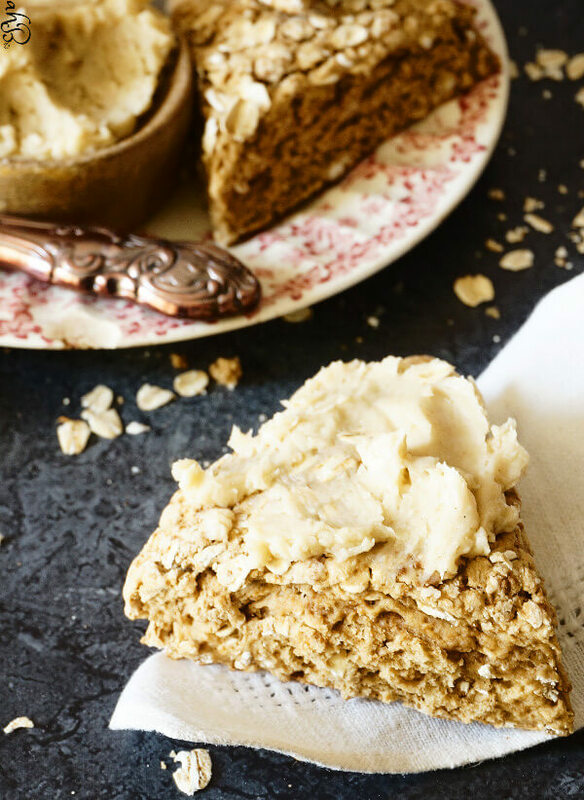 No one will be able to tell that these whole grain scones are a healthy option. My kids sure can’t! Something kind of special happened the other day, my one year bloggerversary! I’ve officially been on the internet for one whole year. I know a lot of bloggers do something special to celebrate their bloggerversaries; bake cakes, host giveaways, make a fancy dinner, things like that. That’s not really my style, instead I spent a quiet day at home, baking and reflecting on my year of blogging. Looking back to last March, I realize I was incredibly naive and quite clueless about how food blogging even worked. Confession time, sometimes I still feel pretty clueless but I think that’s in part to the way the internet and social media is constantly changing. In spite of how unprepared I was, I think I have finally found my thing. You know, something I love and I’m kind of good at. And that feels pretty dang awesome. The part of this journey that has been the most fun for me, isn’t really about me though, it is seeing how excited my kids get over it. There is nothing more fulfilling than seeing their excitement when they get home from school and get to taste test the latest recipe, help me in the kitchen cooking or assist with photos. Nothing compares, not a day of high pageviews, not a pin that’s doing really well, nothing beats our getting to share this together and the memories we’ll have because of it. So while I was sitting reflecting on the day, on what recipe a day like this deserved, I had a mini-epiphany. 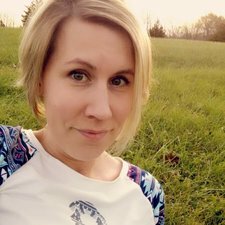 Starting this blog was kind of the one of the best life lessons I could teach my kids. After seeing me give up school and work to stay home with them for years and years now they’ve seen me shake off the dust, take the leap, and go after my dreams. They’ve seen me researching and studying and working hard to learn the ins and outs of blogging. They’ve seen me take on housekeeping jobs so I could earn the money to get the photography equipment. They’ve seen the change that it’s made in me and it’s made them proud. Oh gosh, I’m getting sappy aren’t I? There was this saying when I played roller derby, lots of derby girls would say ‘roller derby saved my soul.’ Not because it actually saved their souls, of course, but because playing roller derby causes you to dig deep and find out what you’re really made of. It shows you the raw guts and power you have just waiting deep inside yourself. Well, I loved roller derby, but it didn’t save my soul. But maybe, just maybe, my little blog and my quest to find and share the perfect scone will though. On to the scones. I wanted to make scones because my instant oatmeal scones were the first recipe I ever posted on Accidental Happy Baker and they are one of my favorite things to bake. I’m not English, but a good scone and cup of Earl grey is hard to beat. I love today’s recipe because it doesn’t require cutting in any butter. 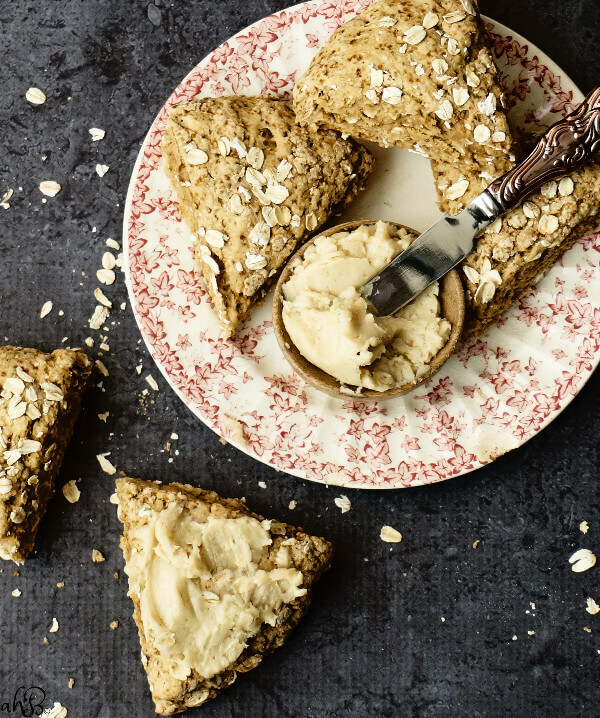 The fat content in these whole wheat scones comes from olive oil instead. These scones come together in just a few minutes. I suggest whipping the maple butter while they are in the oven and then spreading it on when they are still nice and warm from the oven. Pure heaven! Line a baking sheet with a silicone baking mat or spray with nonstick cooking spray. In a medium sized bowl, combine the whole wheat flour, oats, coconut sugar, baking powder, and salt. In a small bowl beat the eggs and olive oil into the buttermilk with a fork, until well combined. Stir the liquid mixture into the dry ingredients to make a crumbly dough. Knead in the bowl, 1-3 times until the dough forms a ball. Turn the dough out onto the prepared baking sheet and pat into a 6 inch round that is about 1 inch thick. Using a sharp knife, cut the dough into 6 wedges. Bake for 15 minutes or until the scones are lightly browned. While the scones bake, beat the butter, maple syrup, and pumpkin pie spice together. 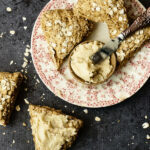 Serve scones warm with maple butter spread. These scones looks tasty and easy to make. Stumbling to share. You’re doing a great job! I’ve enjoyed this year of food with you. Also your instant oatmeal scones are one of my sons favorites so I may have to try these and see what he thinks. Congrats on one year! I just had my one year earlier this month! I was a stay-at-home-mom of 4 years ago! I think it’s awesome that you found your passion 🙂 It took me a little longer, Lol. Seriously, though, your scones do look lovely. I like the fact that you lightened them a bit with olive oil. I don’t make them too often because of the fat and calories, so I may give this recipe a try! This looks delicious!! I have to make it this weekend when I have more time! Thank you!! 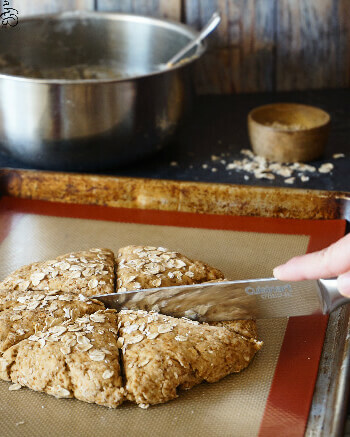 I love how you made scones with whole grains — simply brilliant! And your photos are stunning! I am seriously craving these right now! Happy blogaversary!! It looks like you’re doing a fantastic job! And these scones look absolutely perfect for a busy morning with some coffee, yum! My wife is such a scone fan. She would love the texture of your scones.